A man climbed a tall tower near Metro Bhavan in Delhi on Friday demanding special status for Andhra Pradesh. 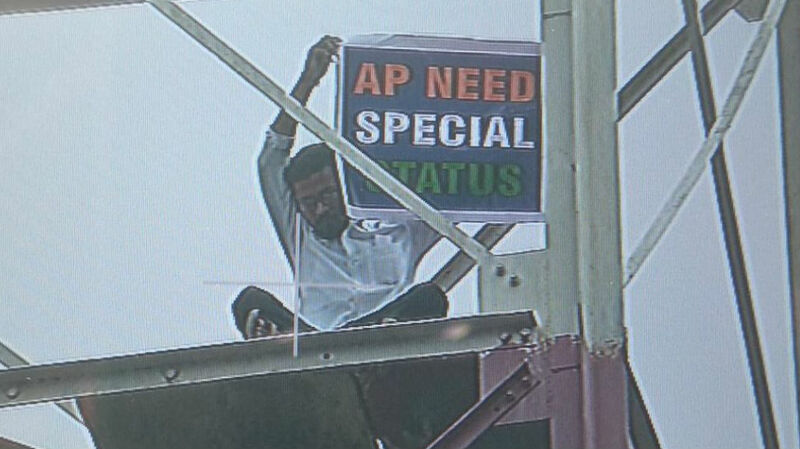 The man climbed to the top of the tower carrying a banner that read, ‘AP NEED SPECIAL STATUS’. .
Police officials reached the spot and tried to convince him to come down. Ruling TDP party has been protesting against NDA government. TDP moved no-confidence motion in parliament that got defeated by NDA. TDP MPs Jaydev Galla and Rammohan Naidu have lashed out at center for not fulfilling bifurcation promises.